had such fun looking around. Heidi loves to cook and I know you will so enjoy her blog, Please visit and enjoy a little bit of Denmark. **Heidi did make a comment below that if you choose to make this recipe, please visit the visitor's part of her blog to help with measurements. 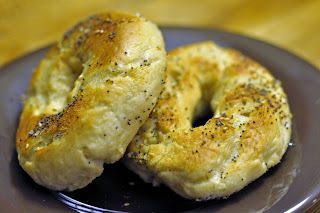 She said that I would used isn't accurate so please visit Heidi's blog if you choose to give these yummy bagels a try! Heidi had so many recipes to choose from. There were some that were easier to translate than others. I decided to make Mini Wheat bagels. I had never made bagels and thought I would give it a try. They were awesome! Mine weren't as pretty as Heidi's. Next time I would take more time to make the dough nice and smooth. Also, I have to confess that I royally goofed. She said to cook them at 200 degrees. I thought that was a little low but I had never made bagels before.....After the first batch was in the oven for a while, I started to question myself. AND... of course - Heidi meant 200 degrees Celsius. I then switched my oven to 390 degree F.... and ended up with wonderful bagels. Warm milk to between 100 -110 degrees F. Pour into a bowl and dissolved the yeast in the warm milk allowing to sit for 5 minutes. Add the softened butter, sugar, salt and egg yolk to the mixture. Add dough slowly and knead until cohesive, soft and smooth. The dough is kneaded by hand for 6 - 8 minutes and approximately 5 minutes if using a mixer at high speed. Line a bowl with a little canola bowl, add the dough mixture and allow to rise in a warm place for an hour. Punch the dough down and form into 16 equal balls and place on a floured surface. Press a hole into the center of each ball, dragging to from a larger hole. Cover the dough balls with a tea towel and let rise for about 10 -15 minutes. Bring water in a large pan to a boil. Boil dough for 2 minutes, flip then two minutes on the other side. Lift them out, drain and lay on a butter lined cookie sheet. Bake at 390 for 20 - 25 minutes or until golden. Sprinkle topping on bagels halfway thru baking - otherwise the topping might burn. Bagels should sound hollow when knocked on the bottom. Wonderful blog you got for SRC. I am so glad nothing was lost in translation. She does have a cute little blog. You picked a wonderful recipe. Thanks for sharing. These would be perfect in the mornings! What a great choice - I am happy that you liked them! Cute little bagels. Great for breakfast bites. I'm thinking I should try these! They look amazing!